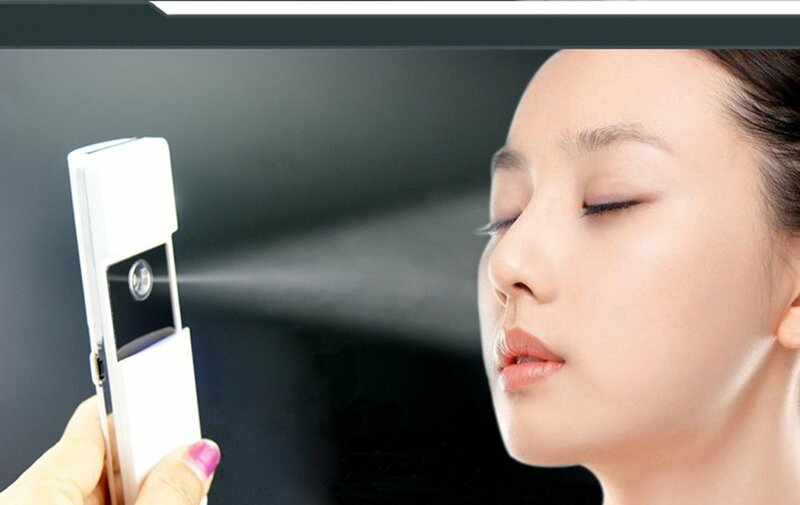 I just love this mini facial sprayer from Ocheetech. I love it in the summer months especially. Living in Oklahoma, our summers get really hot and humid. I love having this sprayer to carry around with me. When it get’s hot and sticky out I just pull out this sprayer and cool myself down. It shoots out a very fine mist, so you are not getting drenched from it. It’s just a very thin layer of moist pray that you can coat your face, neck, hands, whatever. It does provide some moisture though, cools you off a little, and feels great on the skin. It’s really easy to load, it comes with a dropper to fill up the tank. You simply charge it up and it lasts a long time. Everything comes in a black velvet carrying case so you can easily carry it around with you. When I fill mine up I add a couple of drops of essential oils too so it smells great and it’s hydrating my skin and giving me some essential oils all at the same time!! I love it! Easy to use:Push down the switch,then the Ultra-fine Nano sized steam sprays continuously at a constant speed.The quickest time of starting to work is 2 seconds.Easily absorbed through skin, and moisturize skin more quickly. Intelligent design: Accord to human body skin moisturizing process,Each facial sauna time is 60 seconds as a cycle.The sprayer will stop after 60 seconds.You are able to do some adjustments and continue to next 60s cycle.It will help to prevent clogged pores and deeply clean your skin. Rechargeable:Build-in 370mA rechargeable battery.You can do more than 100 times ficial steaming after full charging(Each time is 60s as a cycle).Charging time:2 hours with usb cable. Travel design:Designed as a mini size(4.5 inch * 1.4 inch * 0.8 inch) in your handbag or pocket.Enjoy facial sauna no matter where you are,at office,on flights,outdoor,at restaurant and so on.It also comes with a convenient pouch. Multiple function:Removes Dirt,Oil,other impurities and Makeup;Melts away Dead Skin Cells;Aromatherapy;As nano-steam relaxes and softens your skin;deeply moisturizing to relieve fatigue;60s spa facial treatmen;eyelash extensions,Direct Skin Indulgence & Treatment and so on.